There are so many decisions to be made when you are installing floating kitchen shelves. 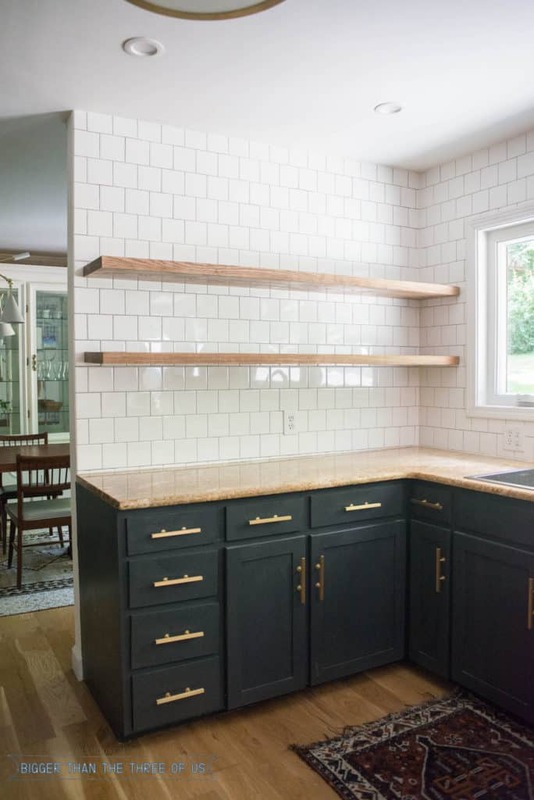 Decisions on questions like: how do you attach floating shelves, should you use heavy duty floating shelf hardware or should you DIY your own brackets? What type of wood should you use for your floating shelves? What thickness of that wood and what stain? Seriously, the list goes on and on. Today, I’m hoping to help you with part of your dilemma on how to hang floating shelves and walk you through different options for what height you should install the floating shelves. 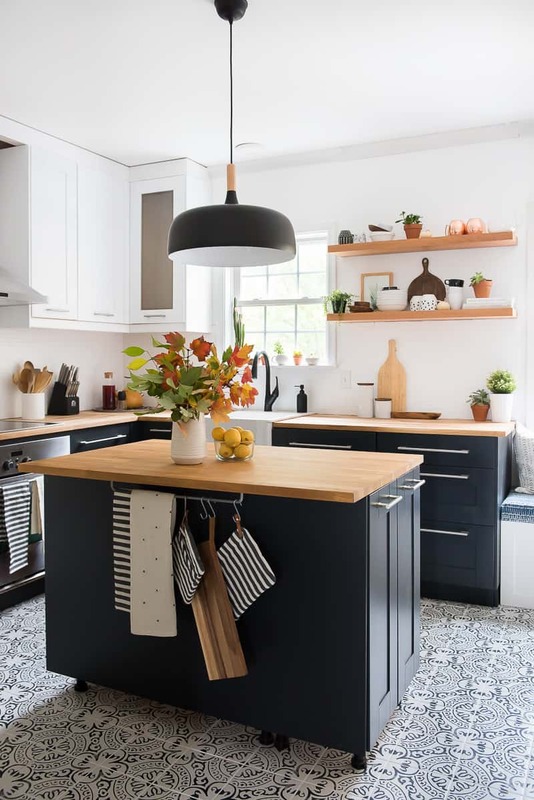 After reading today’s post, if you want even more information, inspiration and how-to details for open shelving, then check out my Heavy Duty Open Shelving Guide. It contains most of the links to all the posts that I’ve done on our floating kitchen shelves. Ok, let’s get to today’s post. I’m so excited! Rather than just talking about my Floating Kitchen Shelves I’m also going to share a few of my Instagram friends and their floating shelves. Under each photo, you will see the inches from the counter to the bottom floating shelf and then the bottom shelf to the top shelf. I know when I’m trying to make a decision on specific sizing, finishes, etc., it’s always extremely helpful when I find a tutorial that lists EXACTLY what I’m looking for. I’m really hoping that this post on the height of floating shelves will walk you through your options and help you decide what will work best in your space. First up, we have Aniko from Place of My Taste. Aniko’s DIY kitchen shelving are mounted a bit higher than mine. She has plenty of room on the counter for taller accessories, like a coffee pot or that wood cutting board that she currently has standing up. Next up is Megan from Every Davis Moments. Megan’s shelves always look so amazing. She’s got an amazing eye for styling. The next set of open kitchen shelving belongs to @kaseydurbin. 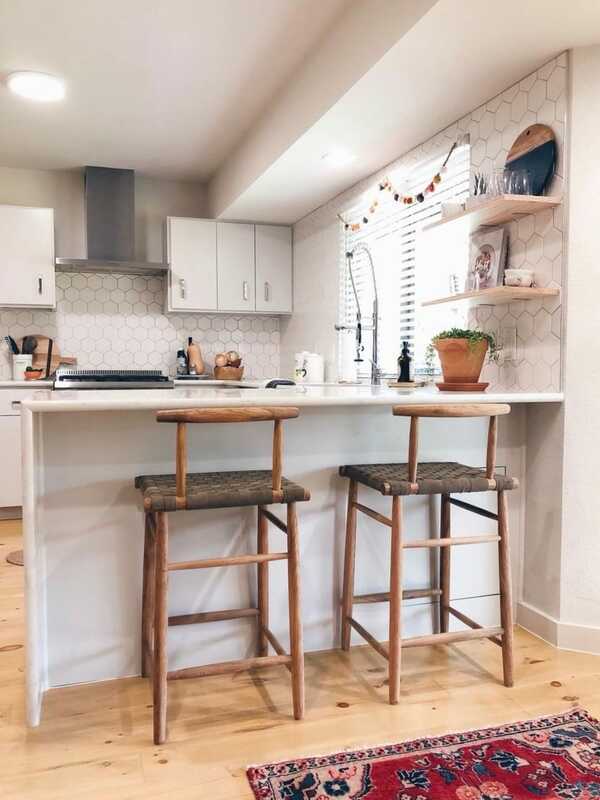 This is totally unrelated to her wood kitchen shelves, but oh my… how about those counter stools? I’m in LOVE with them. Up next is Bridget from the Instagram handle @becrowbe. I think it’s so nice that that her expresso machine fits underneath her shelves! That’s definitely something to consider when you are trying to decide what height to put your shelves up at. Next up is @kassandradekoning and her beautiful open shelves! I really love how her open shelves look! If you have tall ceilings like she does, then mounting three hanging shelves is a great option! Last inspiration image is my own. I love playing around with styling the open shelves and also, the ease of grabbing dishes off them everyday. I would 100% put them up again if we were back at the point where we were deciding whether to do floating shelves in the kitchen or upper cabinets. 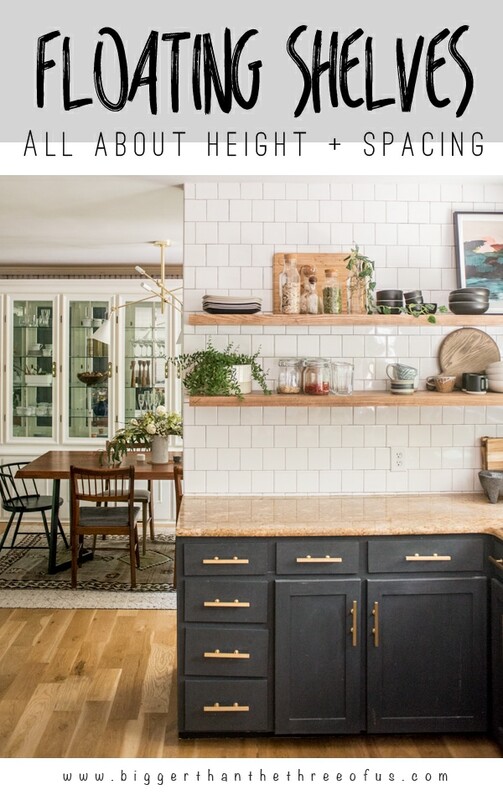 I hope this post really gave you lots of valuable information for how far above the counter to mount your floating shelves and how far to space your shelves on the wall. If you want more resources for installing floating shelves, then make sure to check out my floating shelving guide!